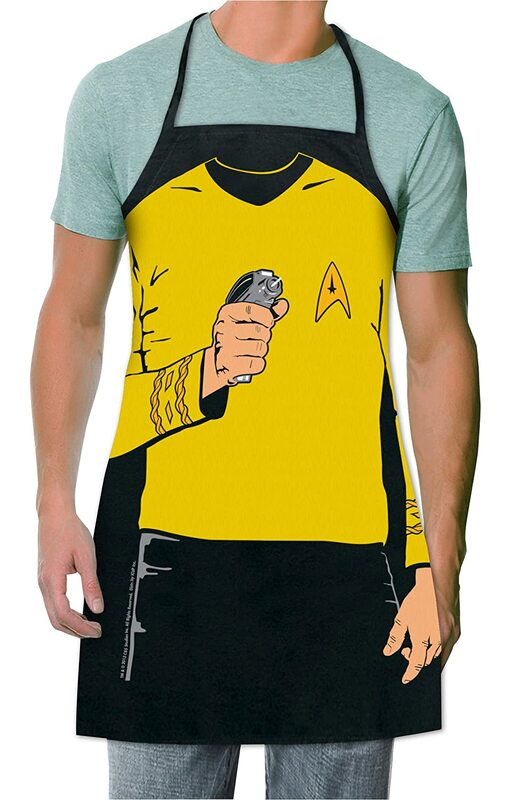 7 Awesome & Geeky BBQ Aprons - Moar Stuff - You don't need it but you know you want it. With summer coming up (and in the US, Memorial Day) it’s time to start thinking about backyard BBQ’s. 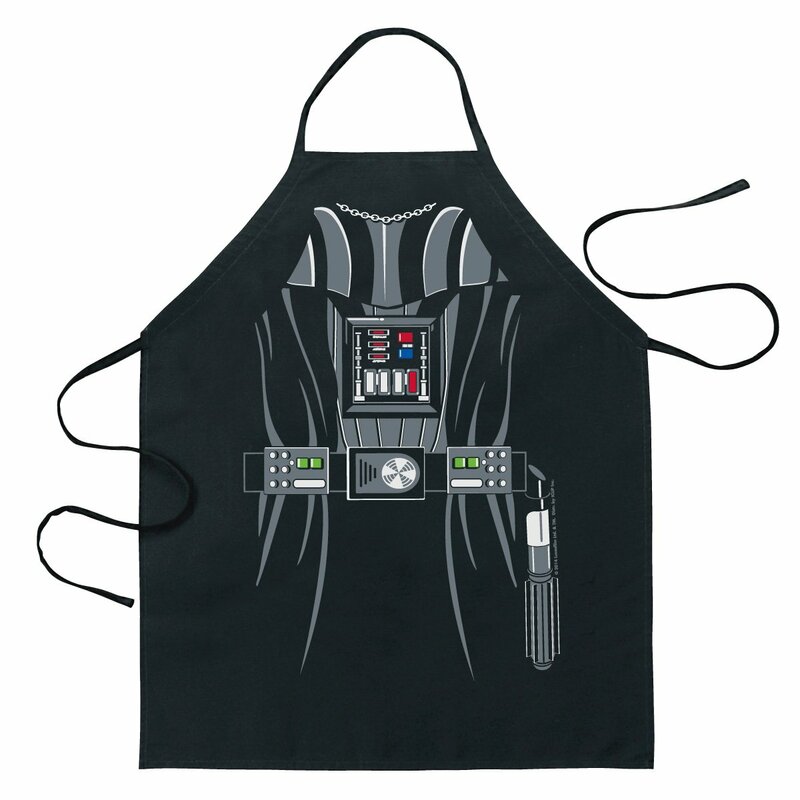 This selection of 7 Awesome & Geeky BBQ Aprons will make sure you can grill in geeky style. 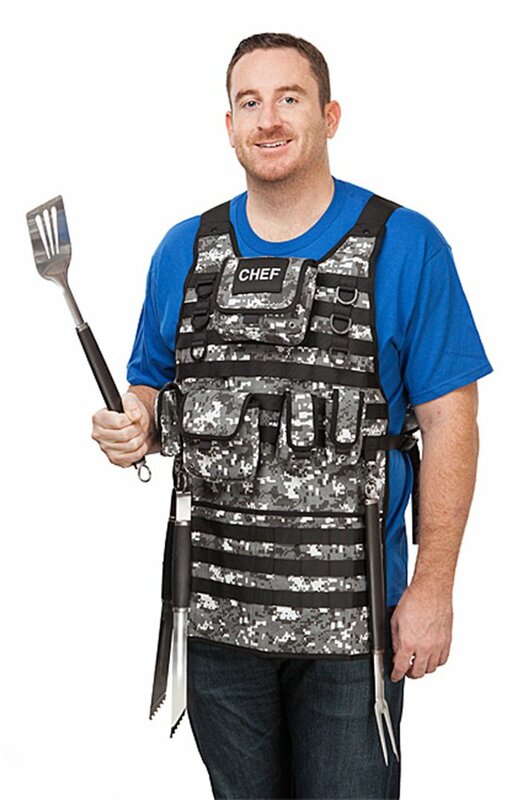 The Tactical Chef BBQ apron features front and back removable hook-and-loop patches which read “CHEF”. It also has 2 large pouches and 3 smaller pouches that are perfect for storing condiments, grilling utensils, salt / pepper… and your phone. The urban digital camouflage pattern will help hide any spills or drips from sauce you were supposed to get on the meat and not yourself. 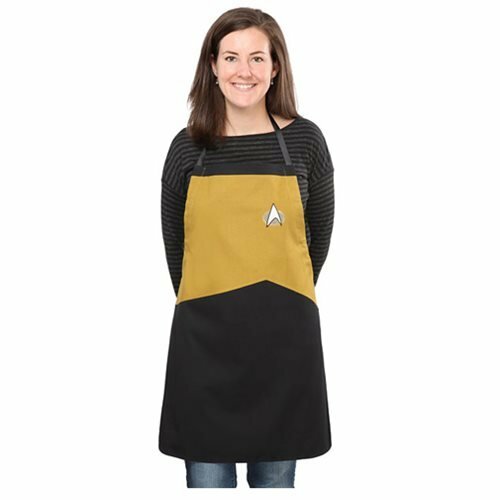 This Captain Kirk apron let’s you take on a bold persona as you freely grill up Tribble steaks and crack open Romulan Ales. Just don’t let your pointy-eared 1st officer keep you from firing up the grill on the bridge of the Enterprise. You don’t care what Starfleet regulations say about open flames on the bridge. You’re the captain, Dammit!! Not everyone can be the captain but, you can be in command of your very own Starfleet-issue grill. Maybe you’re not the captain but, instead, a proud member of the Enterprise-E kitchen staff. So, that means that you’ll be wearing an operational gold uniform. Well, welcome to Starfleet, Chief Grilling Officer – 3rd class. Here’s your uniform. Give into temptation and join the dark side.... We have burgers and brats! Come to the dark side, we have brats and burgers…. You see, despite becoming the Dark Lord of the Sith, Vader never did outgrow the taste of grilled Womp Rats like he used to eat on Tatooine. Now you can channel your inner Darth Vader as you grill dangerous rebel hot dogs and chicken breasts for information about the alliance. Perfect for all of the lady geeks out there who want to channel their favorite Disney Princess. 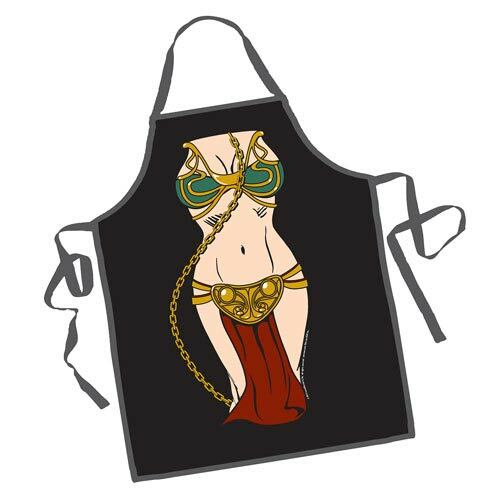 Not to forget about all of the geeky Grill Mistresses out there, we also offer (with a bit of tongue in cheek irony) the Slave Leia BBQ Apron. It wan’t in the script but, I have to imagine that grilling up Klatooine Paddy Frogs was one of Leias duties during her brief stint in Jabba’s Palace. Time to fire up the Bat-Grill and cook the bat-Steaks, eh old chum? Fire up the Bat-Grill and invite Catwoman over for some steak and catnip! 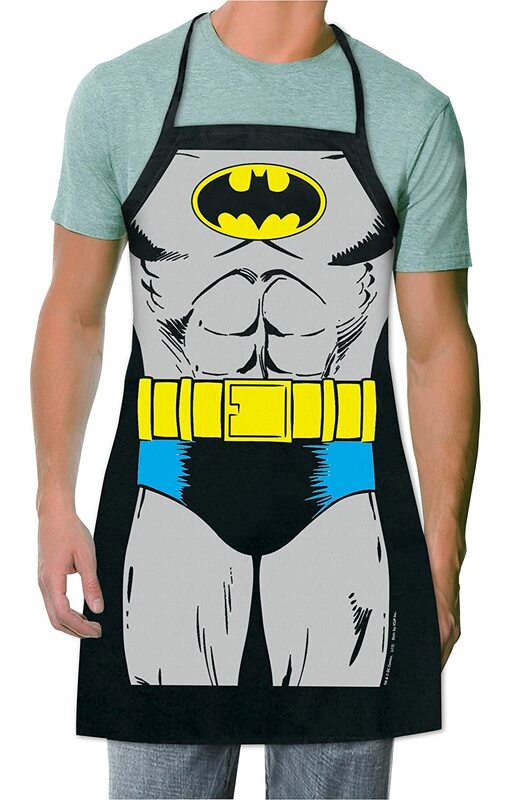 This Bat Man BBQ Apron let’s you channel your inner crime-fighting grill master. Battling the Joker is hungry work, so you might as well enjoy a good BBQ, right? Why yes, I'd like my dragon t-bone steak very rare, please.... Hey, don't tell a dwarf how to eat a steak, dammit!!! After a long session of killing orcs, trolls, and dragons, it’s time to switch from being the Dungeon Master to the Grill Master. You can have your guests roll for initiative to decide whose going to get the first burger from the grill. Now, choose your favorite geeky apron and get the grill cleaned up. Your first geeky back yard BBQ party awaits!